Some say a full moon brings out the madness in people, and a new moon gives us a chance to start afresh. I have a fascination for the moon; an admiration for that huge, bright, spherical planet in the sky, shimmering with light. On silent nights, I watch the moon and wonder what it would be like to go there; to escape the humdrum of our daily lives, the noise, the pain, the stress. Let’s enjoy the silence of the moon. Grabbed me and flew with me high into heaven. For in this moon, my body, by grace, had become soul. Everyone is here at the Full Moon Festival. Friend, what are you waiting for? The bright moon shines above us. There are no clouds tonight. Why bother to ask about lamps and fire? Why talk about cooking dinner? Who is searching and who is finding? Let us just enjoy the moon, all night. We can view our lives in phases; like those of the moon… The phases of our life start from our birth through the various stages of development and growth; the ups and downs of our lives, the periods of tremendous growth and strength, through to the waning years, the fading years, and finally our demise. The Moon represents them all in its lunar phases: New moon, Waxing crescent moon, First quarter moon, Waxing gibbous moon, Full moon, Waning gibbous moon, Third quarter moon, Waning crescent moon, Dark moon… If we pay attention, we’d notice that different aspects of nature mirror the cycles of life. Let’s contemplate the beauty of moon. More below! Positive Motivation Tip: We can wish upon a star or look to the moon for answers… the answers are not there but inside us. The Moon … a celestrial connection to a very long journey here on Earth. It inspires our imagination and fuels our sense of wonder. Nice post Elizabeth. It does add to our sense of wonder and a way to regroup and refresh our body and mind. TY! The top photo is incredible. Absolutely amazing. 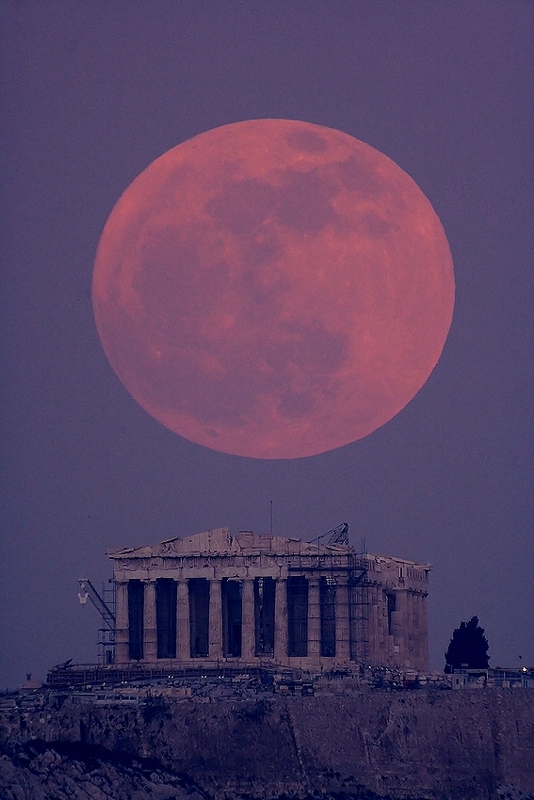 The colour of the moon hovering majestically above the Parthenon is beautiful. I really like the way you write too. It’s not the Parthenon, it’s the Lincoln Memorial. But it is an incredible photo. I can always see the Mad Hatter’s Tea Party in the moon (from where we are). I think therefore it has some link to my childhood for me. The moon drives the tides – who knows what else it can drive on earth? That first pic is gorgeous. Did you take it? Beautiful post. You reminded me of how I used to be so connected to the moon. I used to wonder if my faraway lover was also looking up at the moon… Now it shines in my window at night and lights my face while I sleep and dream of him. On my early morning walk last week, I stopped in my tracks to look at the moon which looked as if it was hanging by an invisible cord over a coconut tree. It was so beautiful – the night light mixed with the morning rays — I wished I had my camera with me. Yes, the moon, especially a full moon, does draw us in. Thanks for this lunar reflection, Elizabeth. The photos are indeed stunning, especially the one over the Parthenon. I’ve always loved the moon. Years ago a friend of mine and I would meet at the barn around 11 p.m. under a full moon and take a mid-night ride under it’s light. The peace and serenity of those night rides bring back fond memories. This was a lovely post. I love your photos and the poems. Great job! I will do that. I wish I’d taken a camera to catch some trail shots while we were riding. It’s a little late now. But ‘Old Timers’ hasn’t got the best of me yet, so I can still remember the fun we had. 😉 . I still have friends with horses, so opportunity might knock again before all is said and done. Who knows? In the meantime, if you ever get the chance, by all means, do a moonlight ride (assuming you like horses), you’ll never forget it. Being a ‘moon child’ I am constantly affected by the lunar phases. Your photo’s, as always, are beautiful Elizabeth. There is something very magical about the moon. Like hiking in only moonlit landscapes, that brings out so many strong feelings and longings. I think it’s quite a mark to have in the night sky. It seems so bright and almost phosphorous, yet it is only reflecting light from the sun. The sister of the sun. Oh my goodness, the pull of that magic moon and so many lovely memories of life’s light from that glow . . . The very most special moon phase for me is when a tiny sliver of a new moon seems to cradle Venus as the evening star! It just seems to offer caring and compassion at that time! Thank you for sharing the beautiful photos. You’ve reminded me to look up more. There is something so alluring and mystical about the full moon! I certainly notice those more. Eliz, I don’ always pay attention to the moon, but when I find a lot of craziness around me, it is often when the moon is full. I like a full moon because I have trouble seeing at night and the pale glow guides me. Yes, I’ve observed the craziness too. 🙂 Love the moon. This also reminded me of the song about dancing in the moonlight. Sorry, can’t think of the artist who sang it. Oh that sounds wonderful and brings back memories of when I had such a window… “Dancing In The Moonlight” is the title song on the 1973 King Harvest album. Gorgeous shots from NASA, Elizabeth! I love the paintings you can find too of what a landscape would look like with multiple moons or suns – such beauty – but nothing compares to the real deal and the beauty of nature. The moon is such like a mysterious being watching us from above. I love its comforting glow at night. Hi. This is a lovely blog, especially as it is on my favourite subject – the Moon. My captivation with it began a long time ago, but my fascination was piqued again last year when, in my bedroom one night, I noticed a full moon right outside my bedroom window. I couldn’t believe how big, and how beautiful she was. Now I keep a close watch on her, as I look forward to her visits. She has a mesmerizing hold on anyone who appreciates her. I was notified by email that you had left a comment but I only saw a link to your site. hope I didn’t miss a written comment. I am new at WordPress, it isn’t as easy to manipulate and negotiate as I thought it would be. Thank you for stopping by my Blog. Thank you, too, for sharing these lovely poetry.